Recovery is partly due to "hot" money inflows, but limited supply will keep the commercial sector on track, while demand for residential housing will be supported by low interest rates, writes Standard & Poor's director. 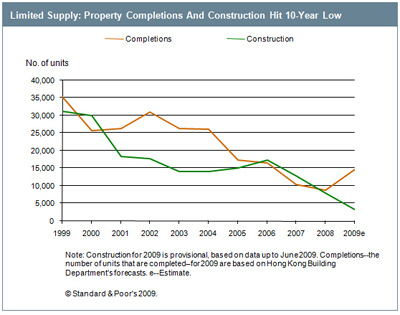 After a bumpy 2008, the Hong Kong real estate market has made a robust recovery so far this year. Prices and transactions rose dramatically in the first half, particularly in the high-end residential market. Sales more than doubled across all segments between April and June 2009 and prices are now approaching the last peak in 2007 to 2008. In July alone, prices rose 9% compared with the average for the previous six months. And buyers have snapped up recent launches, showing that demand is resilient. The recovery is mainly attributable to capital inflows, or hot money, and aggressive mortgage lending. In addition, record-low land supply has helped to keep prices high and low interest rates have encouraged buyers, including upgraders in the mid-end market and investors. That could change if the economic recovery proves tepid and investment sentiment deteriorates. But Standard & Poor's Ratings Services believes that limited supply, low interest rates and strong sales to date still support a stable sector outlook. The worst of the downturn appears to be over for the commercial sector, with operating conditions having begun to stabilise in recent months (see chart 1). In the first half of 2009, most landlords reported improved income due to positive rental reversions. That means existing tenants signed up for new leases at higher rents. While spot rents have generally held up, the rental market is still under pressure due to growing competition from new business districts, such as Kwun Tong, where rents are lower. Although financial services clients are selectively hiring again, this hasn't translated into expansion because many companies still have available office space as a result of previous layoffs. Nevertheless, vacancy rates remain in the low single digits for most landlords despite a contraction in demand. That's because there's only a limited supply of new large office buildings in established commercial districts to compete for tenants. By contrast, in the last downturn in 2002-2003, vacancies rose to double-digit rates. We don't think the sharp increases in property prices are sustainable in the residential segment, and expect continued volatility -- particularly at the high end of the market. The pace of transactions is likely to slow in the second half of 2009 due to fewer properties for sale and somewhat weakened affordability levels as prices have increased. In terms of pricing, we expect a stagnation in the mid-market until the economy improves and unemployment starts to ease. Rental rates are improving but yields, which are at a decade low, are depressed by higher prices. High-end prices are likely to remain volatile. Rental pressure in the office sector should continue until the economy improves and the recovery is entrenched. Rental reversions are likely to be neutral or down over the next 12-18 months with spot rents under some pressure. Vacancy rates should rise due to stronger competition. A sudden and massive reversal of capital flows, which would weaken commercial banks' appetite for lending, is the biggest risk to market stability. This could happen if the investment environment becomes less certain and investors' risk aversion increases. 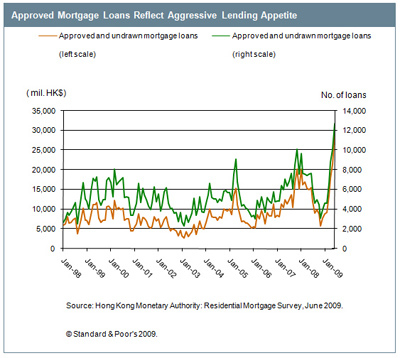 A tightening of credit and higher mortgage rates would undermine demand for residential properties (see chart 2). An increase in interest rates could also unwind investment demand, which is to a large degree supporting transactions and prices, particularly in the high-end segment. However, we don't expect interest rates to rise. Hong Kong rates track those in the US because the dollar is pegged to the greenback. Our house view is that the Fed rates will remain at almost zero through most of 2010. Continued low interest rates should lift buyers' affordability levels and investment demand. The supply of new properties is unlikely to materially rise over the next two years. That's because of development lead times and the government's de facto "high land prices" policy, assuring a controlled land supply. A slowdown in construction schedules this year has also kept supply down (see chart 3). In the first half of 2009, the start of construction on new projects hit a 10-year low after steadily declining for the decade. This is having a knock-on effect on project completions and is keeping prices high. 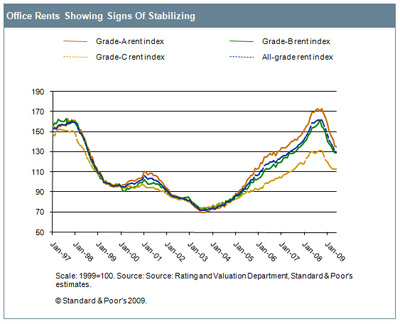 We believe credit profiles are stabilising due to the improved property sales and resilient rental income (see table). Developers have locked in solid sales in the past 12 months at good margins, and the limited supply of new projects should underpin healthy demand for new property launches. Property investors are likely to see limited improvement in their financial performance as rental reversions are likely to be flat to down while vacancy rates should rise. In the residential segment, we expect the financial performance and credit ratios of several developers to improve mainly because of property sales. We see three key constraints on our stable outlook for developers. First, sharp and large increases in interest rates, which would reduce affordability for owner-occupiers and increase holding costs for investors. Second, a reversal of the hot money flow that created investment demand for real estate and has supported banks' aggressive residential mortgage lending at record-low interest rates. And, finally, a prolonged recession or slow economic growth with limited improvement in employment, which would continue to depress the rental market and yields, which are already at a 10-year low. We believe developers with large land banks and diversified products are the best positioned to weather the market cycles and likely continued volatilities. Rated property investors should continue to benefit from the resilience of the rental market given their high-quality rental properties. Investors that are expanding their portfolio of projects overseas, including Swire Pacific (A-/Stable/--) and Hongkong Land Holdings (BBB+/Stable/A-2), should benefit from increased diversity and stability of cash flows. For the overall sector, the foundations are in place for a solid recovery, supporting our stable industry outlook. Christopher Lee is a director at Standard & Poor's Ratings Services in Hong Kong.